Record 3,029 finishers on Saturday! 2 sets of identical twins ran 4 Miler. Malinda caught faster 1/2's in action! 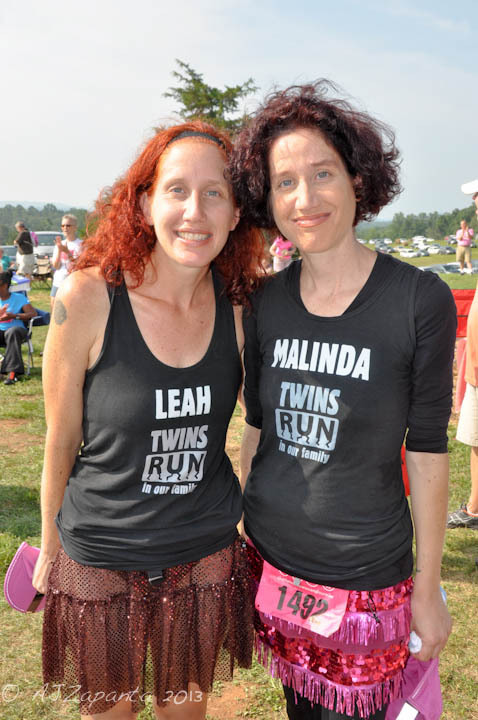 Founded in 1983, Virginia's largest all-women's event is a Charlottesville tradition due to its hospitality to runners and walkers of all ages and abilities. The race is along a scenic stretch of Albemarle countryside and is considered by many women to be their favorite event of the year. Our mission is to raise money for the UVA Cancer Center Breast Care Program and ultimately to reduce the number of people affected by breast cancer. For the 19th straight year, proceeds will benefit the UVA Cancer Center Breast Care Program. The proceeds stay locally and support cutting edge breast cancer research, patient education, support services, and community outreach. With your help, we're looking forward to making our largest donation ever to the UVA Cancer Center Breast Care Program. Last year we raised $335,000 and this year our goal is to raise $400,000! Please ask your "fans" (friends, neighbors, business associates, and relatives) to support your efforts by sponsoring you in this special event.